As of 5pm local time (6am GMT) Oma is 50km west-southwest of Santo and 200km southwest of Sola and is moving east-southeast. The weather service warned of heavy rain and flash flooding especially close to the river banks and coastal flooding. Winds close to the centre are estimated at 95km/h (59mph) and gusts of 130km/h (81mph/h) are expected. Vanuatu’s Meteorological Service said: “Coastal flooding will continue to affect Torba, Sanma, Penama, and Malampa provinces tonight. “Seas will be very rough to phenomenal with heavy and phenomenal swells expected. “People, including sea going vessels are strongly advised not to go out to sea until the system has moved out of the area. The number of provinces predicted to bear the brunt of Cyclone Oma has been extended. The provinces affected now includes Torba, Sanma, Penma and Malampa which have been placed on red alert by the National Disaster Office. Shea Province and the capital Port Vila is on Yellow alert meaning it too must be ready to shut down. Presley Tari, communications officer for the National Disaster Management Office, said with an increasing number of disasters over recent years, people in Vanuatu knew what to do. Most part of the country were likely be shut down as the cyclone moves in from the south. He said: “NDMO is advising everyone to stay alert in their houses. Prepare themselves for the cyclone coming. 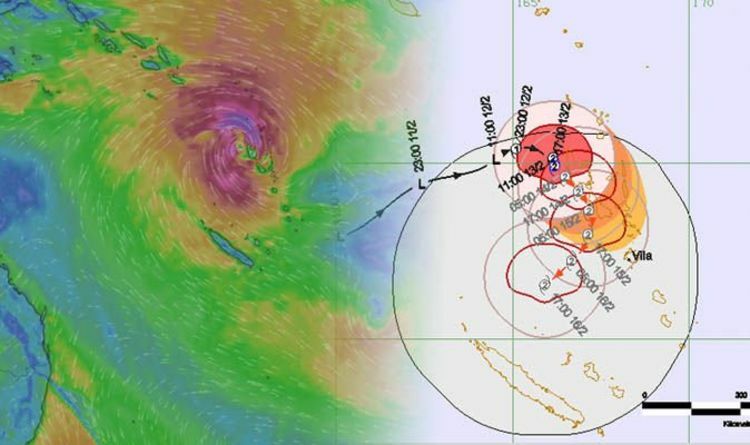 New Caledonia is at risk as Oma slowly tracks towards the islands and is expected to hover near the group of islands for more than a week, which will further the risk for dangerous weather. If weather conditions intensify the storm could potentially grow into a ’severe’ tropical cyclone. Oma is likely to track southwards towards New Caledonia with the potential for a direct strike on Grand Terre during the weekend.